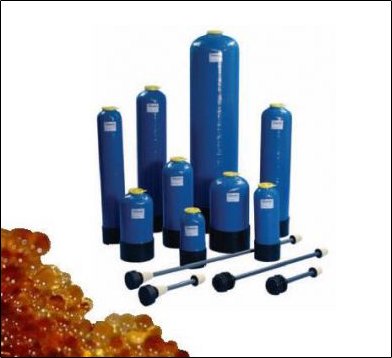 For general use with all Ion Exchange Resins, these towers are used by our customers for the dry-washing of Bio Diesel, using Bio-Lite Biodiesel Purification Resin. For optimum performance, Bio-Lite recommend a minimum resin bed depth of 3 times the vessel diameter, the tower should also be filled with only 50% of its capacity with resin toallow for expansion. Constructed from wound Polyglass (GRP) wrapped around a strong Polyethylene Inner Shell, and fitted with a Polypropylene & PVC Distribution Tube. Available in various sizes, with the most popular models being 1035 and 1044. 010" x 35" has a volume of 39 litres, and will hold 16 Kilos of Resin, purifying Bio Diesel at a rate of 58 litres per hour. As the depth of the tower is more important than the diameter, the next most popular size is 10" x 44" which has a volume of 48 litres will hold 20 Kilos of Resin, purifying Bio Diesel at a rate of 72 litres per hour. There are few pumps which will normally pump as slow as is required to supply the smaller vessels. For the least costly option we recommend our small pump CH100, the flow from this pump can be restricted as low as is desired by using a ball valve on its outlet and timing the through flow (using a measuring jug & stop watch) until you get the correct flow rate. Emptying these towers can be a messy business, this is because the resin eventually expands to fill the vessel and it can be difficult to “dig” it out around the central shaft. In this case it may be necessary to unscrew the cap, and wash the resin out with bio diesel via the distribution system, filtering the resin out of the bio diesel as it comes out of the tower, the resin can then be disposed of. To replace the resin, the vessel should be filled to 50% of its capacity and laid down for the distribution tube to be screwed in without having to force it down into the resin, potentially damaging the tube. Please Note: If the vessel is filled with more than 50% of it's total capacity, the resin as it reaches exhaustion expands and will damage the distribution system. We therefore recommend that you comply with the guidelines.